Online video education is a space that is growing rapidly, and even attracting the attention of Microsoft founder Bill Gates, who thinks that web-based learning sites will revolutionize education. Today, Udemy is launching as a learning site that aims to democratize online education by enabling anyone to teach and learn online. Udemy, which was incubated at the Founder Institute, provides the basic tools so anyone can create their own online course in minutes on any subject they like. Educators can upload presentations, videos, and write blog posts for their online course. Udemy also enables instructors to engage with their users, providing participants with the ability to “subscribe” to courses so they are more engaged. They can also ask questions via the discussion boards and publish links and comments on course to Twitter and Facebook. 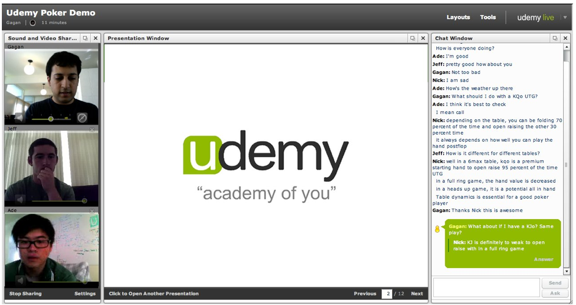 instructors can host a live video conference with students using Udemy’s proprietary live video technology. Udemy Live has a whiteboard, presentation viewer, chatroom, and file-sharing component. Over 10 videos can stream on Udemy Live and 1000+ users can watch a session. Founded by Gagan Biyani, Eren Bali and Oktay Caglar, Udemy hopes to become a portal for any education content, from a yoga class to a calculus seminar. While the online video education space includes a number of worthy competitors including EduFire and Myngle, Udemy ‘s live video technology is impressive and fairy simple to use. And perhaps as more universities and colleges offer online resources for students, video startups could license their technologies.